Hearing amplifiers market size was valued at USD 63.5 million in 2017 and is expected to witness 5.0% CAGR from 2018 to 2024, while global volume is set to cross 540 thousand units by 2024. Increasing elderly population base will drive the industry growth during forecast timeframe. People in the age group of 50 years and above often suffer from impaired hearing and this augments the demand for hearing amplifiers substantially. Recently developed hearing amplifiers improve hearing and makes sound audible by eliminating unwanted external voices. It typically amplifies the sound and also supports individuals suffering from ear injuries. According to WHO, in 2018, around 466 million people globally have disabling hearing loss. Majority of the people suffering from hearing loss fall in the age group of 50 years and above. This scenario proves beneficial for the industry growth as it stimulates the demand for hearing amplifiers. Technological advancements in the hearing amplifiers will trigger its adoption amongst people suffering from severe hearing loss problems that will escalate industry growth during forecast period. Currently technological advancements have enabled user friendly experiences with hearing amplifiers. For instance, hearing amplifiers can be connected with phones that allows users to have better conversations over calls and also allows tracking of cognitive hearing and mental health. The technology introduced in hearing amplifiers also eliminates the buzzing and whistling sounds that enhances users experience thus, surging adoption of hearing amplifiers. However, social stigma pertaining to the use of hearing amplifiers in adults may restrain industry growth to some extent. On- the-ear segment was valued at USD 44.6 million in 2017 and considerable revenue size can be associated with the increasing demand for on-the-ear hearing amplifier. On-the-ear amplifiers reduce the risk of reduced cognitive functioning and dementia that are prevalent in people suffering from hearing loss. Also, people utilizing hearing amplifiers impact the individual’s performance positively at work place that will boost the demand for on-the-ear hearing amplifiers over the upcoming years. In-the-ear segment will experience 5.3% CAGR during the forecast timeframe. Recently developed in-the-ear amplifiers are compatible with smartphones. Also, in-the-ear amplifiers are easy to adjust and provide maximum convenience to the geriatric population using these amplifiers. High preference for in-the-ear amplifiers amongst the adult as well as geriatric population will trigger the segment growth. Hospital pharmacies segment accounted for 41.8% in 2017 and is expected to show similar growth trends during the analysis period. Considerable segmental revenue share can be accounted to the growing sales of hearing amplifiers from the hospital pharmacies. Hospital pharmacies provides over the counter hearing amplifiers for people with, mild hearing loss or hearing loss caused by other medical conditions. Some hospital pharmacies have fully trained audiologist that helps in providing hearing amplifiers as per the users need and condition that will boost the segment growth in upcoming years. Online pharmacies segment will experience 5.7% CAGR during the forecast timeframe. Various online pharmacies offer innovative hearing amplifiers with several discounts and as per the consumers need. 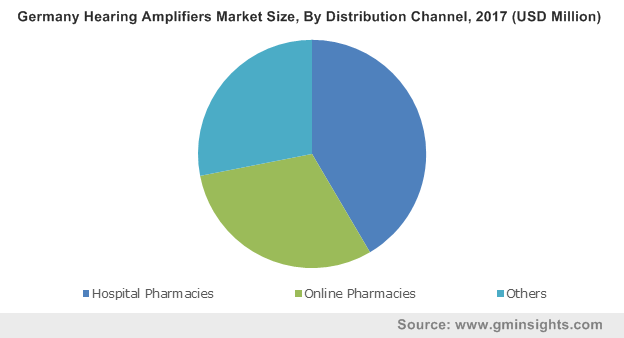 Majority of people prefer to buy latest and convenient to use hearing amplifiers through online pharmacies that will stimulate the hearing amplifiers business growth in upcoming years. 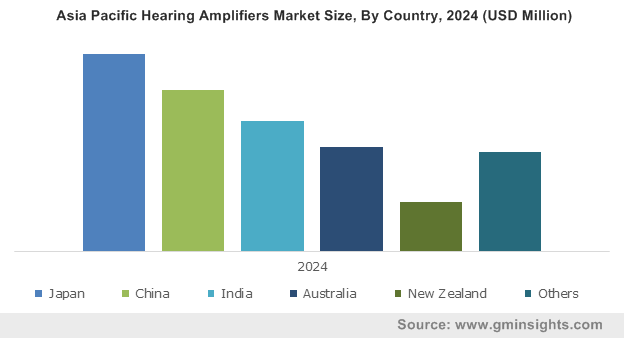 U.S. hearing amplifiers market will experience 4.7% CAGR and is expected to grow substantially during the forecast timeframe. 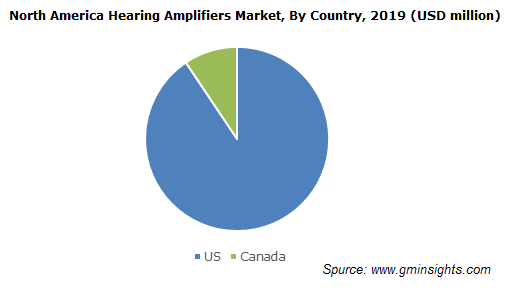 High market growth can be attributed to the rapid technological advancements in hearing amplifiers that will increase their availability and foster U.S. industry size over the coming years. Also, growing awareness regarding availability of technologically advanced hearing amplifiers amongst population suffering from hearing loss will increase the adoption of smart hearing amplifiers with wireless connectivity enabling better speech understanding, clarity and convenience to patients thereby, boosting the industry growth. India hearing amplifiers market was valued at USD 2.2 million in 2017. Increasing geriatric population is one of the major growth drivers. Majority of the geriatric population suffers from hearing problems that elevates the demand for hearing amplifiers. Moreover, favorable government support and funding for hearing amplifiers will also favor industry growth during the forecast timeframe. 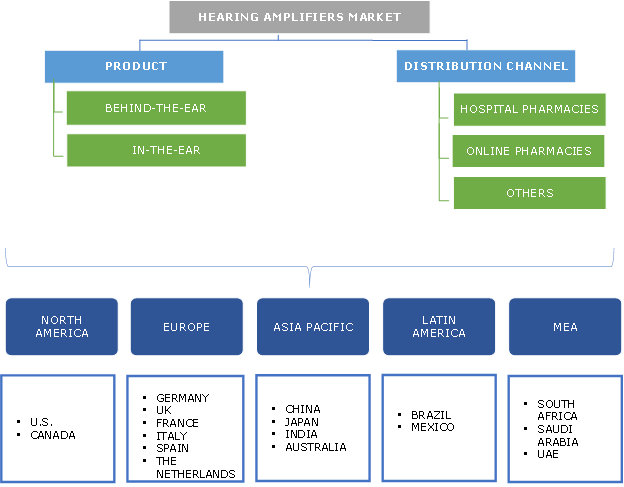 Prominent industry players operational in hearing amplifiers market includes Beurer, Doppler Labs Inc., Eargo Inc, Etymotic Research Inc, FocusEar, iHEAR Medical, Inc., IntriCon Corporation, Nuheara Limited, ON Semiconductor, Sound World Solutions, Starkey Hearing Technologies. These key industry players implement strategies such as new product launch, mergers and acquisitions to sustain market competition. For instance, in March 2018, iHear announced partnership with Atlazo. Partnership with Atlazo will enhance iHear’s hearing systems product portfolio thereby, rendering the company with competitive advantage. Hearing amplifiers history can be traced back to 19th century. The earlier developed hearing amplifiers had less efficiency and were not able to amplify the sound to a greater extent. The first hearing amplifier was less compatible and worked by capturing and amplifying sounds into the inner ear. However, these amplifiers proved inefficient as they possessed inability to filter the non-required external sounds. Recently introduced hearing amplifiers have greater ability to eliminate external sounds thus, increasing the clarity helping people to better understand conversations. Also, technological advancements have allowed body and brain health tracking through hearing app developed by various companies. Hearing amplifiers industry is still in developing phase and will experience numerous advancements in foreseeable future that will prove beneficial for industry growth.